I hope you all had an enjoyable Christmas and are feeling refreshed and ready for another exciting term. The children have returned to school re-energised and ready to learn, which is fantastic to see. We have had a great first week back and are really looking forward to getting involved in our topic ‘Around the world’. We will be exploring different parts of the world and the children have already discussed the places that they would like to learn about. Next week we will be starting our adventure by wrapping up warm for our icy adventure to the Arctic. We need your help and expertise, if you can support our topic, by bringing in books or resources (photos, clothes etc.) from different countries that you have visited or by coming in and talking to the children about a country that you have visited or lived in then we would really appreciate it. The children love to hear about peoples experiences first hand and it really helps to engage them in a topic. For the first few weeks we will be looking at colder countries and then we will be jetting off to warmer climates, looking at Australia and ending the term in China, just in time for Chinese New Year. Please let me know if you would be willing to come and talk to the children. The children returned to school buzzing with their exciting holiday news. We all enjoyed sharing our news with the class, it is great to see how confident the children are when sharing their news with the rest of the class. They are also beginning to understand and demonstrate why it is important to listen to others. This week we have started to talk about setting ourselves goals, this links with our focus for this term ‘going for goals’. Over the coming weeks we will be deciding on our individual goals and thinking about how we can achieve them. In P.E we have been thinking about ways that we move our bodies. We warmed up our bodies by going on an imaginary walk, on a really cold day. The children had to think about the clothes that they would need to wear. We then explored different ways of moving and in different types of weather. Our focus for this term is team games and dance. On Tuesday, as well as sharing our holiday news with the class we wrote it in our learning journeys. I am really impressed with the writing that the children produced, you can see that they are using their knowledge of phonics to help them with their writing. We will be writing our news in our learning journeys every Monday, you might want to help your child by discussing their weekend and what they might like to write. In our phonics lessons we have been playing bingo, the children really impressed me by writing their own sounds on their bingo boards and then listening carefully to the sounds that are called out and checking their bingo boards. We have also played ‘buried treasure’ a game which involved reading words and deciding whether they are real words or made up words. Do try both of these games with your child at home. In our smaller groups we have been writing simple words and reading captions to check if they make sense. This week we have enjoyed playing lots of maths games. Games like dominoes are fantastic for developing children’s understanding of maths, as well as turn taking. In our whole class sessions the children are getting really good at counting how many children are in the class. We are beginning to talk about one more and one less than number. This week the children have enjoyed making some quite elaborate 3D models using the construction materials. This has required lots of concentration and a great deal of perseverance when things haven’t gone to plan. This week we have started to think about our topic ‘around the world’. We have started our topic by discussing all the things that we would like to find out about different parts on the world. The children had some fantastic ideas and next week we will be exploring all things Arctic. Just a reminder that phonics keyrings need to be returned by Thursday each week. We will then add the sounds we have been learning to your child’s keyring and send them home, in homework folders, on a Friday. WOW leaves for this month are in homework folders. These will then be shared on Friday 29th January. Red words- Today your child has a copy of the red words we have learnt this week in their homework folder. Please keep them at home, you might want to put them somewhere that your child can easily see them, so that they can practise reading and recognising them. Red words are words that cannot be sounded out, they need to be learnt by sight. We will send red words home in homework folders as we learn them. Please could you save 2 and 4 pint (clean) milk cartons. 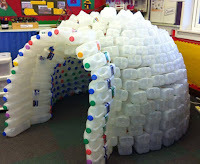 We will be making an igloo (just like the one on the left) as part of our ‘Around the World’ topic and the more milk cartons we have the better our igloo will be. Please could you continue to support your child when writing their name. They need to use a capital letter for the first letter of their name and the rest of the letters should be lower case. We are encouraging all the children to write their name clearly and so that others can read it. Friday 15th January- 8.30am Open morning. Please join us to have a look at your child’s learning journey. The focus for this open morning is maths and it would be great if you could stay and play some maths games with your child. Thursday 11th February- International evening.